Walnuts are a nutrient dense nut that support a healthy heart, assist in maintaining your ideal weight, and are good for your brain, skin, and hair. They’re also an antioxidant powerhouse, anti-cancerous, and provide anti-inflammatory action. Not too shabby for this little brain shaped nut. High in fiber, vitamin C, and manganese, strawberries also support a healthy heart and impart antioxidant, anti-inflammatory, and anti-cancer properties along with helping to regulate blood sugar. Not bad for this little red burst of flavor. I used extremely frozen strawberries and my smoothie turned out nice and thick. Enjoy! 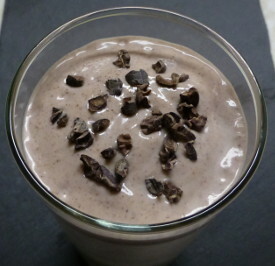 I’d love to know if you try this strawberry walnut smoothie and how you liked it. Please leave a comment below. Happy Blending! I also add 1 banana, 1 tbsp of hemp seeds and a handful of spinach. Excellent additions, Ana. Your version sounds delicious! Question: Can unsweetened, dark chocolate cocoa powder be used in place of the cacao nibs? If so, would I use the same measurement?